With prescriptions for antidepressants and sleeping medication at an all-time high, emotional stress is definitely a sign of the times. Enter Rosalene Glickman and her Optimal Thinking Emotional Mastery Wallet Cards. Best-selling author and President of The World Academy of Personal Development Inc., Glickman has developed a unique at-your-fingertips tool that empowers the everyday person to gain control, and resolve disturbing emotions by themselves, for themselves. “The purpose of our wallet cards is to optimize the thinking and performance of individuals on the spot,” she states. When we make the most of our thinking and emotions with Optimal Thinking, we are in the driver’s seat. We accept, understand, and optimize! With prescriptions for antidepressants and sleeping medication at an all-time high, emotional stress is definitely a sign of the times. Enter Rosalene Glickman and her Optimal Thinking Emotional Mastery Wallet Cards. Best-selling author and President of The World Academy of Personal Development Inc., Glickman has developed a unique at-your-fingertips tool that empowers the everyday person to gain control, and resolve disturbing emotions by themselves, for themselves. “The purpose of our wallet cards is to optimize the thinking and performance of individuals on the spot" she states. Rosalene Glickman Ph.D, who was born in Australia, began her career as a high school Physics and Chemistry teacher and later became Chair of the Science Department. She has earned a Ph.D. in Psychology, a Teaching diploma and degree in Business Administration. She is also the international best-selling author of Optimal Thinking (Wiley, and translated into 14 languages), hailed by academia and the media as "the successor to positive thinking." She provides life and executive coaching, business consulting and training for individuals and organizations. Clients include the U.S. Army, Warner Bros., Johnson & Johnson, BP, California State University, National Australia Bank, Internal Revenue Service, and many others. Dr. Glickman has also been honored by the media as "Australia's Most Successful Woman" and received the "Woman of the Year" award for National Business Women's Week in Hollywood. She has been featured on Fox News, Bloomberg TV, CBS Weekend Magazine, New York Times, Business Review Weekly, Australian Business Magazine, and many more. Glickman is deeply concerned that emotional mastery is not taught in schools, and takes the greatest pride in her wallet cards. 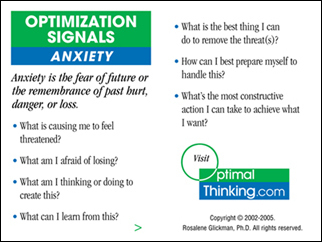 Optimal Thinking Emotional Mastery Wallet Cards contain roadmaps to understand the specific messages signaled by turbulent feelings such as anxiety, anger, disappointment, guilt, and depression. If you experiencing or overwhelmed by such feelings -- losing sleep over work-related issues, fuming about unfair treatment, or feeling anxious about dealing with the tasks at hand -- you can select the appropriate 2" by 3" double-sided card and process your feelings on the spot. According to Dr. Glickman, “Turbulent feelings are optimization signals. They alert you that your thinking or actions may not be in your best interest. When you access the cards and answer the Optimal questions, you immediately gain understanding, explore your options, and can determine your best solution. You can then make the right decisions and in turn, make the most of your life. Isn’t this what emotional intelligence is really about?” Glickman believes that many people could reduce or even eliminate prescription drugs and visits to therapists by substituting this do-it-yourself tool. “When we make the most of our thinking and emotions with Optimal Thinking, we are in the driver’s seat. We accept, understand, and optimize!” she concludes. For more information or to arrange a media interview, contact Jay Willick at (310) 557-2761 or visit http://www.optimalthinking.com. THE WORLD ACADEMY OF PERSONAL DEVELOPMENT INC.